Tickets are now available for the 2018 Truffle Masters chef competition Jan. 29 at the Astorian, 2500 Summer. 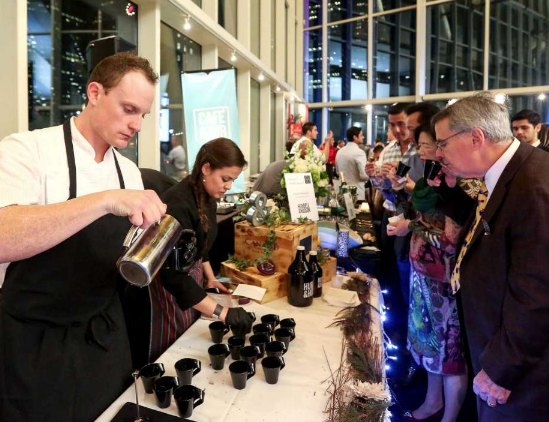 The event features top Houston chefs working with fresh black truffles. Chefs confirmed for the 2018 challenge include Luis Roger from BCN Taste & Tradition; Robert Del Grande from Café Annie; Philippe Verpiand from Étoile Cuisine et Bar; Edel Gonçalves from Fielding’s Local; Austin Simmons from Hubbell & Hudson; Teddy Lopez from Killen’s STQ; David Denis from Le Mistral; Danny Trace from Potente; Ryan Lachaine from Riel; Jeff Taylor from Steak 48; and Ho Chee Boon from Yauatcha, among others. The winner will receive 1 kilogram (about 2.2 pounds) of black truffles. Tickets are $175 per person at 7 p.m.; $275 for VIP admission that begins at 6 p.m. with cocktail hour that includes caviar samples and truffle appetizers. For more information: thetrufflemasters.com. Grazia Italian Kitchen has announced its third restaurant, set to open in spring in the Villagio Town Center, 22764 Westheimer Parkway in Katy. The 7,100-square-foot restaurant has space for 300 diners and will feature a speakeasy bar similar to the one tucked in the original location in Pearland. The second location is in Clear Lake. Former Houston Press restaurant reporter and critic Cuc Lam is collaborating with longtime Houston restaurateur Jerry Lasco to open Sing, a casual, Singaporean-inspired restaurant opening in the Garden Oaks/Oak Forest neighborhood in spring. The restaurant also will feature dishes from China, Vietnam, Thailand, India and Malaysia. Lasco is the founder and CEO of Lasco Enterprises, which owns and operates the popular restaurant brands Max’s Wine Dive and the Tasting Room. Lam, who will run the day-to-day operations at Sing, has presented her food at pop-up events in Houston; she said she has cooked Vietnamese, Chinese and Thai cuisine for more than 20 years. Sing will serve Thai iced tea and Vietnamese iced coffee in addition to wine, beer and sake on tap. Lam said that more than 90 percent of the menu items are gluten free. The restaurant will seat 20-30 inside with an addition dozen seats on the patio.